Bauhaus had been kicking around for a few years without ever troubling the chart-compilers. The record label then hit on the wheeze of releasing, as their eighth single, a cover version of one of the most famous songs written and recorded by David Bowie. This was at a time when Bowie was being accused on selling out, what with hitting the charts with duets with firstly Queen and then Bing Crosby (!!) and rumours flying around the music industry that his next LP was going to be a real crossover pop/dance effort. All the label on the 12″ single says is ‘released by arrangement with BBC Records’. It was years later, thanks to a CD compilation of all their BBC sessions, that it could be revealed it dated from a July 1982 session recorded for the David ‘Kid’ Jensen Show on Radio 1. The track got to #15 in the UK charts and proved to be the band’s only Top 20 hit. Finding their audience drying up in favour of rock music, two young mouse folk singers find themselves with a bleak future. Desperate for a better career and life, the female vows that she would do anything to become a rock star. Instantly, the Devil arises to take advantage of that and offers to make her a star in exchange for her soul. She agrees and she quickly becomes the star she’s dreamed of while her boyfriend, Daniel Mouse, is left behind. On the night of her greatest triumph, the devil comes to collect on her soul. In desperation, she turns to Daniel who must attempt the impossible task of trying to find an escape loophole for his girl’s release. I’m guessing being a family cartoon young Daniel finds a way…..but I’m still quite tickled at the band showing such a cracking sense of humour. Over on the flip-side the track Third Uncle is also taken from the same Jensen session as Ziggy. It’s a cover of a Brian Eno composition, originally released in 1974. I’ve never heard the original, but I’m happy to make a blind bet that the Bauhaus version is wildly different. Oh and I’m happy that having just played it for the first time in nearly 30 years, it has been added to the i-pod list cos I like it…. The final track was much anticipated. Recorded live at Fagins in Manchester and featuring Nico from The Velvet Underground on co-vocals, this very disappointingly sounds like two drunk patrons being backed by a wedding band. Total letdown. It takes a lot to get my mate Jacques the Kipper really excited. Even at the football, when I’ll be ranting, raving and close to foaming at the mouth as a result of one or more of the ineptitude of our players, the niggardly tactics of our opposition or the uselessness of the match officials (especially every lino over on the Railway Stand side), the best you’ll get out of him is a half-growled ‘C’mon’ – and even then it is usually stifled halfway through for fear of drawing attention to himself. It’s the same with music. If he hears something good, he’ll casually mention it in conversation some time later. He’s a regular use of social media but it tends to be observational more than anything else. iPod. So much fun this morning. Bela Lugosi’s Dead followed by Pass the Duchy (what a great record that is in retrospect) then Public Service Broadcasting followed by some old school soul from Bettye Swann. Never a big Bauhaus fan much to my friends at the time disgust. But BL is some record and I must have danced to it a million times. Interesting to reassess PtD – amusing retrospect how popular it was given it’s a bunch of kids taking drugs. But as a reggae tune I think it stands the test of time. For those readers who perhaps have no idea of what he’s talking about, click here. Talking of shuffling, tune in next week to WYCRA as there’s a few guest postings due to be featured, including yours truly. 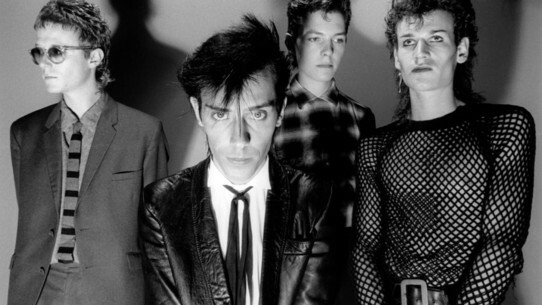 Bauhaus are one of the many bands of the early 80s era who could lay claim to having a say in the ‘invention’ of goth rock. It’s fair to say that most folk will recall the name of only one member of the four-piece, that of singer Peter Murphy. And yet, the fact is he only became part of the band when the others approached him, not because of his vocal talents, but simply because he had the right look. There’s no disputing that Murphy was one of those blokes who it was impossible for even the most hetro and red-blooded male to deny was good-looking. Certainly, there were plenty of us who tried hard to capture the image, be it the impeccably prepared hair, the sharp as a razor cheekbones, or the piercing eyes made all the more memorable by the clever application of make-up. Bauhaus never quite made it the way so many expected them to. I was surprised to find out that of the 11 singles and 4 EPs released at their peak between 1980 and 1983, only two of them actually cracked the Top 40, and one of these was a cover of Ziggy Stardust (indeed, this was their biggest success hitting #15 in 1982). As has been widely reported this past week, 66 year old David Bowie has made the twelve-strong shortlist for the 2013 Mercury Prize. It would therefore seem, as far as the critics and others who make up the Mercury judging panel that his latest LP, The Next Day, is one of the best 12 albums released in the UK this past year. I can’t say whether this is the case, although I strongly suspect not. I’m more inclined to think that his inclusion is more to do with giving a high media profile to this year’s award than the merits of what was his 26th studio LP. 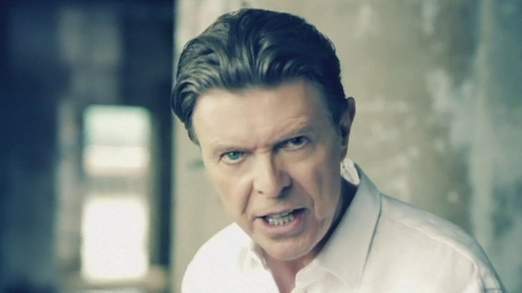 The reason that I can’t say for sure is that I’ve given the LP a total bodyswerve, as I have all his new material ever since the travesty that was Tin Machine in the late 80s and early 90s. If any of you have remained loyal and faithful to his output in recent years, please let me know if in fact the latest LP is worth investing in….after all, I’m going to be bombarded with it on displays any time I venture into any High Street music store between now and the awards ceremony at the end of October. Bowie is a performer who I’ve long felt ran his course in the mid 80s. Just about all of his albums from the 70s have more than stood the test of time – it should also be recognised just how prolific he was in that decade with an an album in every year except 1978 – but then again there had been two absolute classics in 1977 in the shape of Low and Heroes. I also remain fond of parts of Scary Monsters (and Super Creeps) from 1980. The worldwide phenomena of Let’s Dance in 1983 was truly something to behold with the production and sound capturing the popular music of the era quite perfectly, albeit it was a long long way away from the music I was listening to. It’s a recod which made Bowie the #1 box office attraction for a few years – the royalties from the classic rock stations playing the hit singles from that era must still be mega given how often I stumbled upon them during my recent few weeks in Canada. My admiration for Bowie began to fall away around the time of Live Aid. Many have said that he was one of the outstanding performers that day but I was disturbed by the fact that out of all his back catalogue he chose to perform Heroes and in a way that seemed congratulatory to all the rock stars who had shown up that day in London and Philadelphia. Actually, the only reason I’ve included that FF cover is that the dooh-doohs at the start are supplied by Girls Aloud…..very bizarre!